Château de Grignan, a medieval castle turned into a Renaissance palace, on the hilltop above the little village of Grignan and its lavender fields. and try a river cruise. 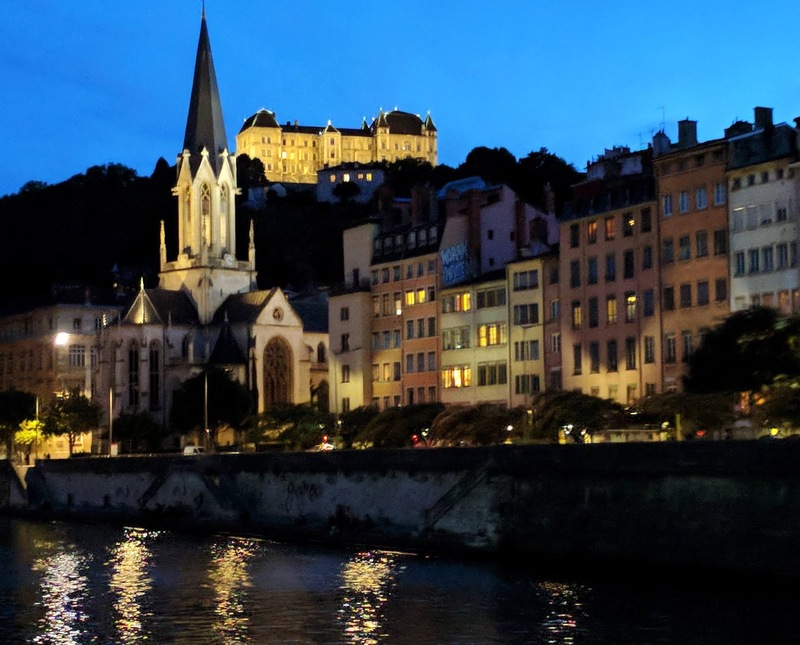 Uniworld offered eight days going up the Rhône and Saône Rivers with daily excursions in the regions of Provence, Auvergne, and a bit of Burgundy. It sounded like exactly what I wanted to try, especially when my favorite cruise companion Brenda said she'd join me. The cruise turned out to be excellent: Consistently good excursions, delicious food, handsome rooms, sleek ship, nice staff, and perfect weather. You wake up and the destination has come to you. Brenda savoring sun and Saône. We often had the upper deck all to ourselves. Gusts of the wonderful wind (called Mistral) had knocked over a couple of chairs. 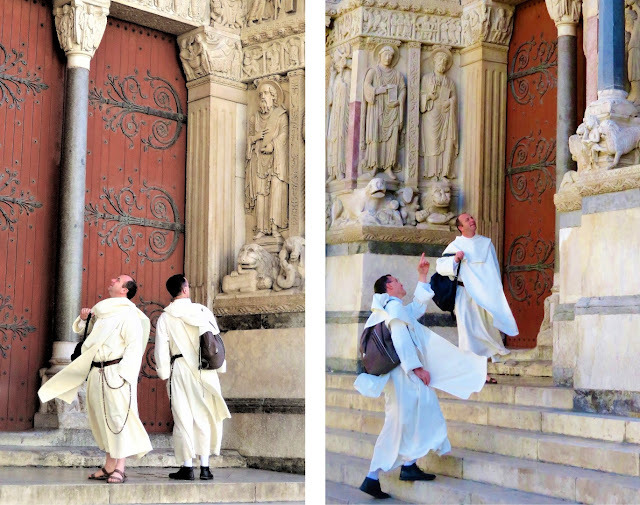 Two visiting monks explore sculptural details on Arles' Church of St. Trophime. 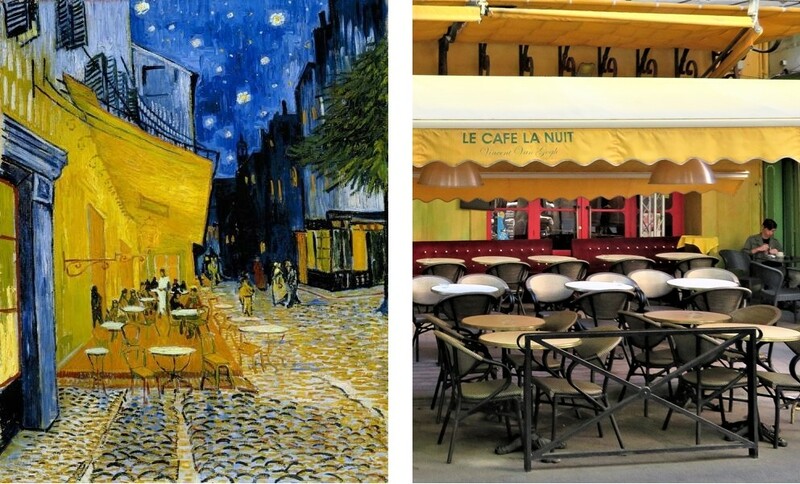 When Van Gogh fled Paris in 1888 he came to Arles. 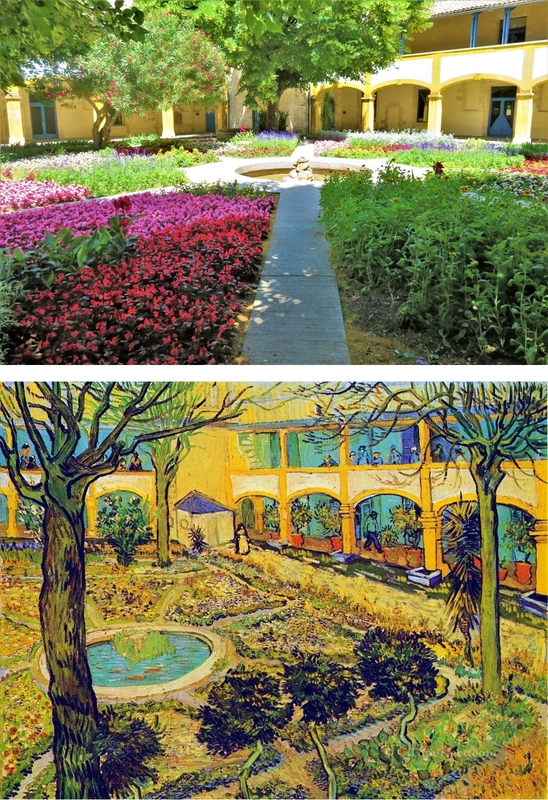 Above is my photo of the scene for his painting Garden of the Hospital in Arles. The Cafe Terrace on the Place du Forum, Arles, at Night. For nearly 70 years in the 1300s, Catholic Popes were in Avignon, not Rome. The papacy was housed in this "Palace of the Popes" (viewed from a Ferris wheel). Remains of the (apparently famed) medieval bridge at Avignon. Surely these French kids ― along with all on our cruise except me ― know the child's song "On the Bridge at Avignon" but I never heard it as a boy in Texas. Biking in Viviers down a row of plane trees. Above this corn field is the old town of Viviers featuring St. Vincent’s Cathedral. 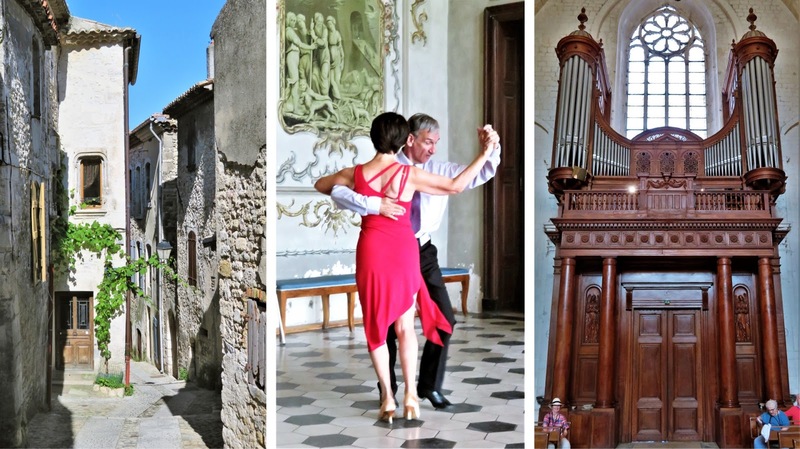 After an interesting walking tour around the narrow medieval streets of Viviers, we heard a superb concert on the grand organ at St. Vincent's, then more town touring and a fine display of French-related dances by our guide who is also a dance instructor. Fields of lavender in June bloom. Took dozens of photos of the lavender fields but will resist posting them all. 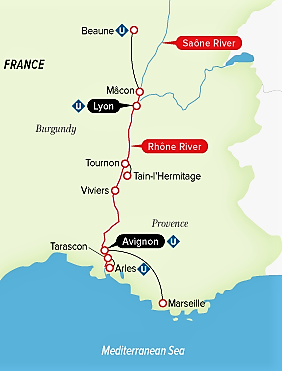 In Côtes du Rhône wine country are twin villages Tournon and Tain-l’Hermitage. Puligny Monrtrachet vineyards growing the top "Appellation Grand Cru." The Rhône and Saône rivers merge at Lyon, France's second largest metro area with about 2,300,000 people. Impressive place with a charming old town and lively riverside. Lyon is called France’s culinary capital. We visited the famous Les Halles market where the rows of cheeses were especially mouthwatering. 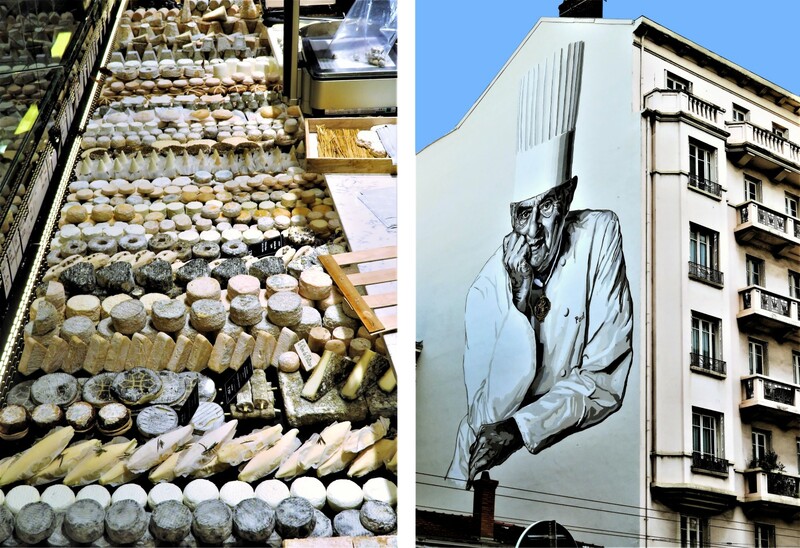 Across from Les Halles is this mural celebrating influential Chef Paul Bocuse. Length: 443 feet (135 m) ― almost 1.5 American football fields long! Width: 37½ feet ― as wide as possible to still fit into locks. Height: Maximum to just fit under Rhone bridges (often requiring that the captain's bridge be lowered into the body of the ship). Uniworld's new SS Catherine must have been purpose-built for the Rhône and Saône. Engineered for maximum capacity, this very elongated ship manages to fit tightly into all locks and just under all bridges. Look at this cruise ship slipping beneath this Lyon bridge. We came even closer. Loved to be up top when we went under a low bridge. Note the crew has taken down blue sun roofs and the captain's bridge has been lowered a bit. Some bridges were so low that passengers were not allowed up here. You could reach out and touch the walls of the locks. More than in any country I can recall, France has long, elegant rows of evenly spaced trees lining roads and boulevards. Going past a castle in Tarascon dating from the 1400s. 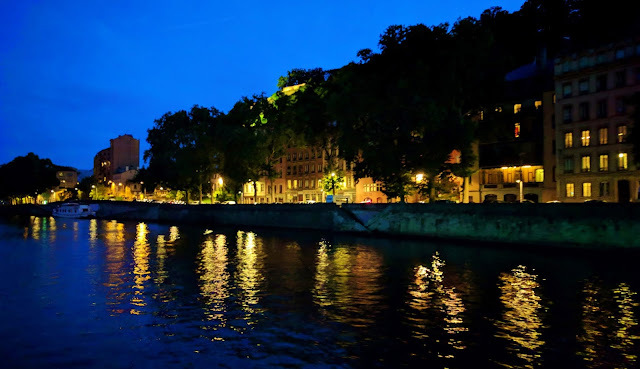 ...as the lights of Lyon shimmer in the Rhone. Rare sunset when the Mistral was not blowing the water. Another sunset to enjoy from the top deck. I'm omitting the wine tastings, gelato tastings, crêpe tastings, patisserie tastings, truffle tasting and hunting, market day in Beaune, Roman ruins, and more. Gotta wrap up: Wonderful week.